Seleção: OVALLC.PspSelection. ( Salve em sua pasta de seleções My PSP Files ). 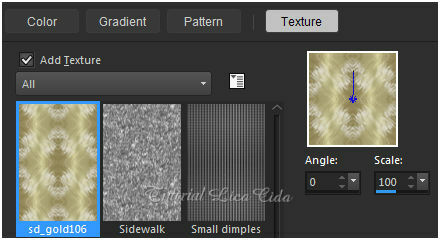 Texture: Texture _ sd_gold106 ( Salve em sua pasta de Texture My PSP Files ). 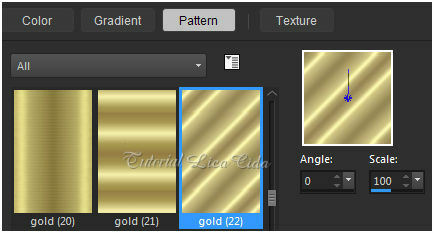 Pattern_gold (22) ( Salve em sua pasta de Pattern My PSP Files ). Deco: Birds of a Feather II_33\ nuvens. 1-Abrir nova imagem transparente de 1000 x 800 pxls. _Preencher com o gradiente formado pelas cores : #bea584 e #715341. Configurar Linear. 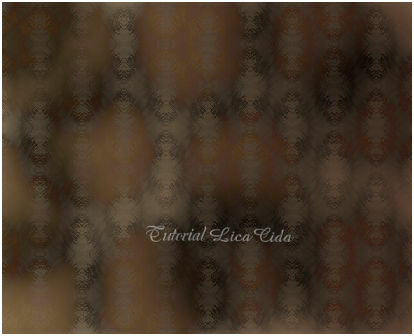 2-Na mesma layer com o Flood Fill Tool , aplicar a Texture _dar três \quatro pinceladas . _Pincele sobre a layer suavemente com o botão direito ( cor escura ) do mause. Realce a gosto a Texture . 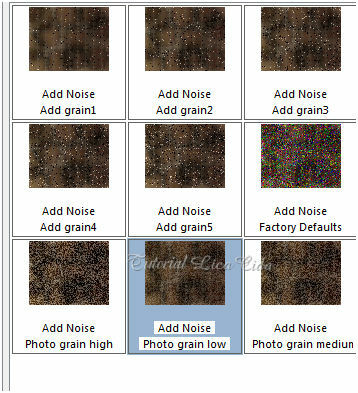 4-Effects\ Effects Browser...Add Noise\ Photo grain low. 5- Edit Copy na 10mist_paysage_animabelle \ Paste As New Layer. 6- Effects\Texture Effects\ Texture ( 02-5b569- texture ). ( você irá arrumar o mist depois do usar o tube principal ). 7- Edit Copy nas nuvens anexada\Paste As New Layer. Objects\ Align\ Top. _ Adjust\ One Step Photo Fix. 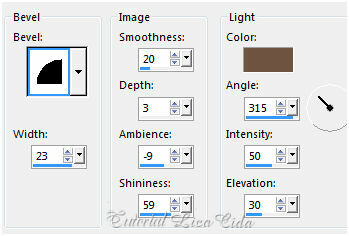 _Blend Mode= Luminance(L) . Layer\ Arrange Move Down. 8- Ativar a layer superior ( raster2 ). _Selections \Load \ Save Selection \ Load Selection From Disk \ Load \ovallc.PspSelection. _Preencher com a Pattern gold (22) ou use a gosto. _Selections\ Modify\ Contract 4. Delete. _ Preencher com a color=foreground ( #bea584 ). _Selections\ Modify\ Contract 28. Delete. _ Effects\Texture Effects\ Texture ( 02-5b569- texture ) ( print ítem 6 ). 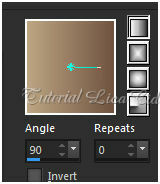 12-Effects\ 3D Effects\ Inner Bevel. 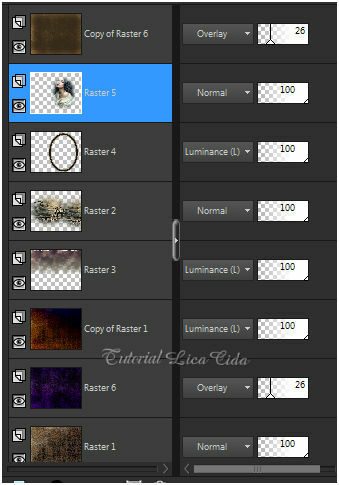 _Ativar a layer superior ( Raster 6 ) . Layer\ Merge Down ( duas vezes ). 13- Selecionar com a ferramenta Magic Wand _ Default a parte interior da seleção oval. _ Edit Copy mentali-misted1424 \ Edit Paste Into Selection . Selections\ Select none. _ Adjust\ One Step Photo Fix . * arrumar a paisagem a gosto. 15-Edit Copy Birds of a Feather II_33\Paste As New Layer. Posicione. _Raster4 _Effects \ 3D Effects \ Drop Shadow 0\ 0\ 80\ 40,00. Color=000000. 16-Ativar a Raster1 . Layer duplicate. 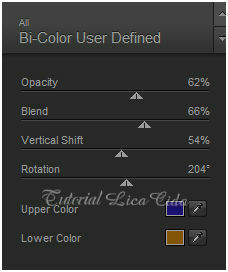 _Plugin Nick Software\ Color EfexPro 3.0\ Bi-Color User Defined. 17-Ativar a Raster1. Edit Copy no cristalback. Paste As New Layer. _ Layer duplicate \ Layer arrange bring to top. 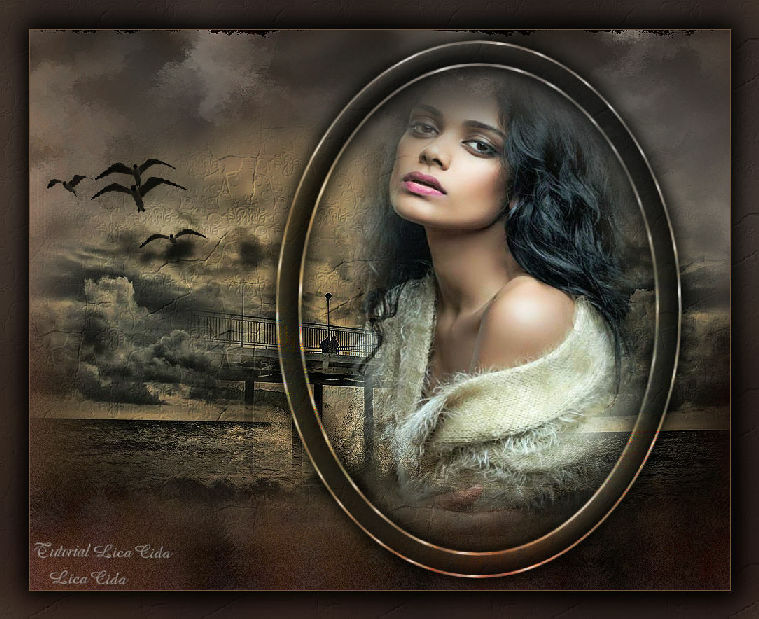 19-Image add borderes 1 pxl \ color background ( escura ). _Image add borderes 1 pxl \ color foreground ( clara ). _Image add borderes 40 pxls \ color= #ffffff. Invert. _Edit Paste Into Selection . _Adjust\ Blur \ Gaussian Blur. R=28,00. _ Effects\Texture Effects\ Texture ( 02-5b569- texture )( print ítem 6). Adjust\ Sharpness\ Sharpen More. _Effects \ 3D Effects \ Drop Shadow 0\ 0\ 80\ 40,00. Color=#000000.